Y.C. Wong, one of the senior Hung Ga gung fu authorities teaching in the United States today, began his lifelong training as a child in his ancestral village in Hoi Ping County, Gwong Dung province, China. He was introduced to the Hung Ga Style by his father and by a village uncle -- a gung fu brother of Lam Jou, the nephew and successor of the famed Hung Ga master Lam Sai Wing. The difficult economic and political situation in Mainland China caused Y.C. Wong's father to go to Hong Kong in 1950. The elder Wong's prior association with Lam Jou's gung fu brother back at the ancestral village led him to seek and study under Lam Jou. A short time later, the rest of the family followed and moved to Hong Kong. Not long after arriving in Hong Kong, young Y.C. Wong, too, followed his father and studied under Lam Jou. He became Lam Jou's apprentice in both dit da bone-setting and gung fu. During early mornings he often went up to a nearby mountain to train with his teacher and si hings (older gung fu brothers), and during afternoons and evenings, he helped with the dit da clinic business and served as assistant instructor helping younger gung fu brothers. Y.C. Wong mastered the hand and weapon techniques of the Hung Ga style and later opened his own dit da clinic and gung fu school in Hong Kong. In the early sixties he and his family moved to the United States, and when he eventually settled in San Francisco in 1967, he opened a gung fu school in San Francisco's Chinatown. He was one of the first Chinese teachers to accept and teach non-Chinese students. Wong continues to maintain the traditional way of teaching - he personally teaches his gung fu classes, explaining the philosophy, techniques and principles to his students. 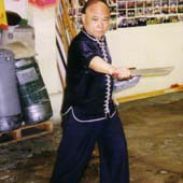 Wong has been involved in the training, teaching, and promoting of Chinese martial arts for more than sixty years. He often has been present at martial arts demonstrations and events throughout the United States, delighting the audience with his famed double chain whips and with his lightning-fast two-man empty-handed or weapon sets. In 1968 he was one of a group of young gung fu masters to organize a large gung fu exhibition, the first of its kind in the United States. Many magazines, Chinese and other foreign periodicals included, have featured Wong many times in their periodicals. Inside Kung Fu has included him in their "Who's Who in American Martial Arts" as one of "America's most respected and well known martial artists." 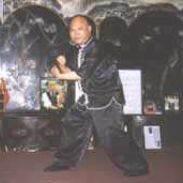 Besides Hung Ga, Wong is highly skilled in the traditional northern style of gung fu, Peg Gwa, which he studied under the famous Gang Dak Hoi, master of Taai Sing Peg Gwa style and a close friend and sworn brother of Lam Jou. Wong also teaches the three internal styles - Gwong Ping Yeung Taai Gik Kyun (Guangping Yang Tai Ji Quan), Baat Gwa Jeung (Ba Gua Zhang) and Yi kyun (Yi Quan). Y.C. Wong currently has a branch school in Prague, Czech Republic, Czech Hung Kyun Gung Fu Association. Chinese gungfu has had a long developmental period. Its extensive scope and profound principles put it in a class by itself. There are many branches and styles, all originating from the same concepts. Those who desire to understand the true meaning of gungfu should seek out qualified instructors and train with skilled friends. Extrapolate the techniques and forge your style with diligent and consistent practice. Be sure to avoid laziness and procrastination. Guard against arrogance and boastfulness. Do not be easily provoked. Seek to analyze with an open heart and open mind. Those who have mastered the art should use it honorably. Teach and help others so many can benefit. Propagate gungfu so that the art will endure.